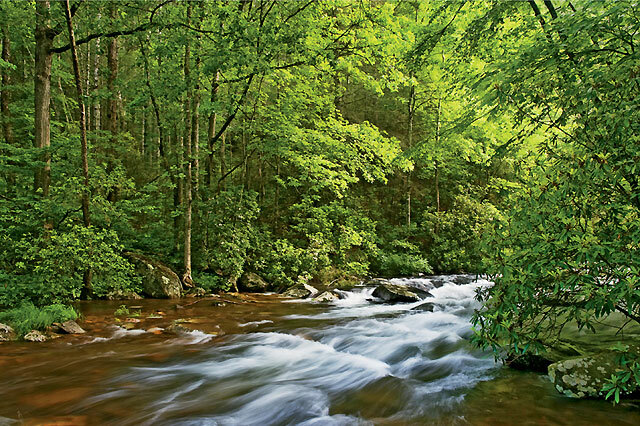 Fires Creek threads its way through the tangled highlands of North Carolina's Tusquitee Mountains. a wild beast or a god." A solitary line of bear tracks greets us at the mouth of Rockhouse Creek, looping through the mud that rings a massive trout pool, snaking around a rusted Forest Service gate, and disappearing into a wonderfully tangled mess of rhododendron and laurel. The metaphor isn't lost on us. Loneliness runs deep here in Fires Creek basin, a 21,000-acre wilderness ringed by a horseshoe-shaped range of mountains carved by the creek and its tributaries in North Carolina's southwestern corner. Our goal for the day is to follow one of these forks upstream to its source, some five miles and 2,000 feet above us, chasing bears and other creatures that might be strolling in the Appalachian woods on a fog-encrusted spring morning. The region is renowned not for its endangered species or its stark wildlife, but for its solitude--which is itself endangered here in the East. There are no dramatic spring flower shows, no epic animal migrations played out for the masses to see. The beauty of the basin lies hidden in its shadows. Giant old-growth birches lurk in the farthest way-back coves. High on 5,200-foot Potrock Bald, near the creek's source, the bedrock has small depressions said to have been used as cooking pits by Native Americans. A large population of black bears trolls the woodlands between.